A recent University of Washington study showed that up to 20 percent of the United States population avoids the dentist due to dental fears or phobias. This means that as many as 64 million people are afraid to go to a routine dental visit! But neglecting the kind of routine care that prevents problems creates the worst kind of vicious cycle in patients. For anxious parents, this is a pattern we want to break in our kids. There are a few important ways to make this happen, and most important of all are overcoming your own fears and building a comfortable and trusting relationship with your pediatric dentist. What Are The Most Common Causes of Dental Anxiety? Fear of pain: in some cases, patients develop a fear because of a past painful experience, but in other cases, simply the fear of pain based on information from media, friends or family members can cause anxiety. Fear of needles: in many cases, the injection of a local anesthetic, rather than the procedure itself, causes anxiety. Choking or gagging reflex: this can be a big one for children who sometimes have trouble controlling their gag reflex. Loss of control in the dental chair: in both children and adults, the sensation of losing control can cause alarm. This is why building a sense of trust is so important. Anxiety by association: in the case of young patients, parents’ attitude can be a significant contributor. If parents have fear or anxiety about dental visits, it almost always comes through to their children. What Are Dental Fears Versus Dental Phobias? According to the National Institutes of Health, dental fear is a reaction to a perceived threat (as in fear of pain or loss of control). A phobia is persistent, unrealistic, and intense fear and is far more challenging to manage. In the case of younger children, dental fear or anxiety is far more common. But fear can turn into a phobia if not addressed early. That’s why managing dental fear or anxiety early and establishing a trusting relationship with your dentist in early childhood is so important. What Happens If My Child Avoids the Dentist? Avoiding the dentist or waiting until problems arise is an approach we want to avoid. When your child avoids the dentist, it creates a vicious cycle of pain and fear. When your child’s introduction to the dentist is a positive, pain-free check-up, she’s likely to come away with a sense of calm and trust. However, if your child’s first visit involves more complicated and possibly painful procedures like fillings, this reinforces the negative connection between the dentist’s office and pain. This is why we recommend scheduling visits with the pediatric dentist early and on a regular schedule. This builds up a reserve of warm and positive feelings before any issues occur and create a meaningful sense of trust. How Can I Erase My Child’s Dental Fears? Communicate with your provider: If your child has dental anxiety, NOVA Pediatric Dentistry & Orthodontics offers strategies to help them eliminate their fears. Keep calm: your attitude about the dentist shapes your children’s attitude and behavior. NIH studies have confirmed that anxious parents pass on their fears. Breaking this cycle is key to creating a healthy attitude in your children. Offer a pre-visit pep talk with a focus on the benefits and positives of a trip to the dentist. Choose the right practice for your child: according to the NIH, dental office atmosphere can play a prominent role in how patients feel about the dentist. Choose an office with a calming atmosphere and gentle providers who are specially trained to work with children. Your pediatric dentist can help with everything from soothing words to breathing exercises. Positive reinforcement: both practitioners and parents can help make dental visits a success with positive reinforcement. Whether it’s a small non-food prize or gift card or a trip to the playground after the visit, focusing on the positive can be a great tool. Sedation dentistry: in cases of extreme anxiety and with special needs children, sedation dentistry is often an appropriate and constructive approach, and there are a range of options available. Your dentist uses conscious sedation to put your child in a relaxed state without the need for general anesthesia. The most common forms used in children are nitrous oxide (also known as laughing gas) or mild oral sedatives. New drugs have made oral sedation safer than ever for children, and have been approved by the American Academy of Pediatrics, the American Academy of Pediatric Dentistry and the American Dental Association. If your child suffers from extreme dental anxiety, conscious sedation may be the best approach to allowing him to get through a more complicated procedure or helping him tolerate a local anesthetic. Do Adults Have Dental Anxiety? Yes! Adults absolutely have dental anxiety, but in many cases, it starts in childhood. Dental anxiety in adults can sometimes become so ingrained that therapy is needed. 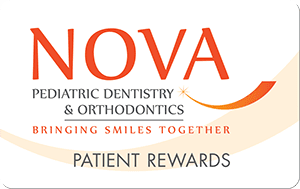 At NOVA Pediatric Dentistry & Orthodontics, our goal is to avoid creating anxious patients by using tried and true calming strategies. And if you’re a parent who suffers from dental anxiety, keeping your own fears in check and paying attention to how you communicate with your children about the dentist are essential ways to help them build a positive, fear-free outlook that will benefit them for years to come!